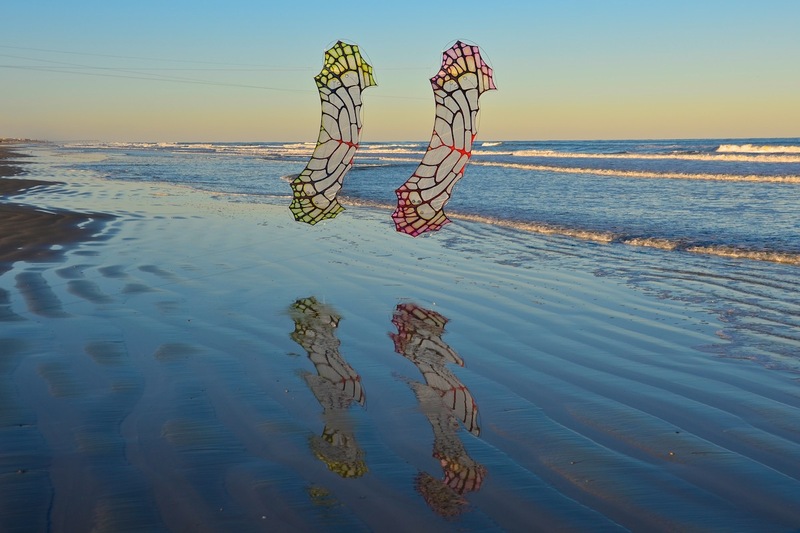 Our most efficient quadline, the Flame is smooth, light, and is able to surf air currents so slight that they are barely detectable, and will easily perform indoors under the power of the pilot alone. The uniform tension over the sail is derived from the double opposed-bow frame. 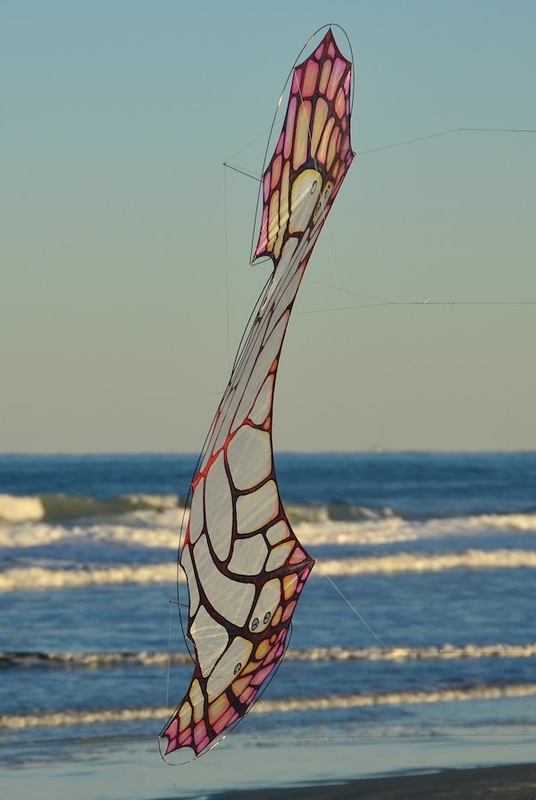 Unlike other four line kites, the WindFire Flame uses a structure that curves continuously. 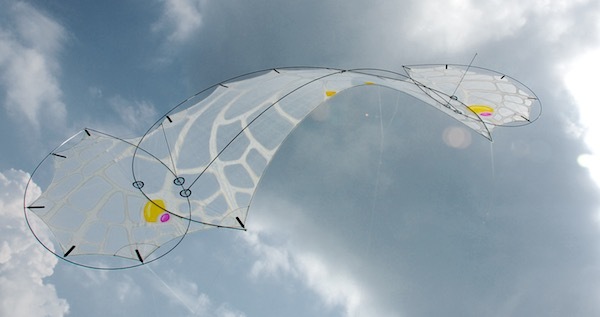 By pre-loading the carbon frame into arcs that support the perimeter of the form, the sail can be tensioned uniformly using much smaller diameter rods than are traditionally found in a kite of this size. The basis of the Flame comes from our Photon design—the unique single line with a frame that has neither a spine nor a spreader. The Flame was built upon this concept, as if two Photons shared a central sail area. 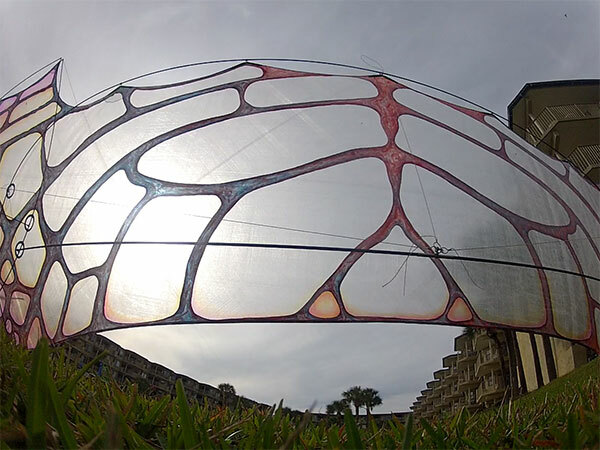 With an eight foot wingspan, and weighing only 3.5 ounces, the Flame is among the lightest kites of this size ever built. 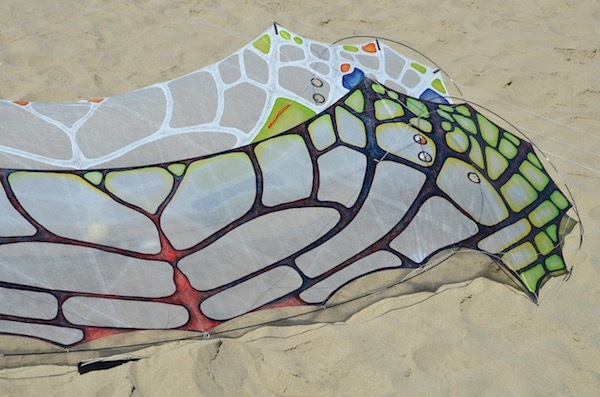 The sail is cut from a lamination of spectra and mylar, and then painted by Ruth Whiting. The Flame's structure uses almost 37 feet of carbon fiber. The curves of the frame load the carbon at close to the bending limit. This takes maximum advantage of the stiffness of the rods, and creates a smooth wing that changes shape in a controlled way. As the sail loads up during flight, the frame's stiffness is carefully balanced to control the change in shape. 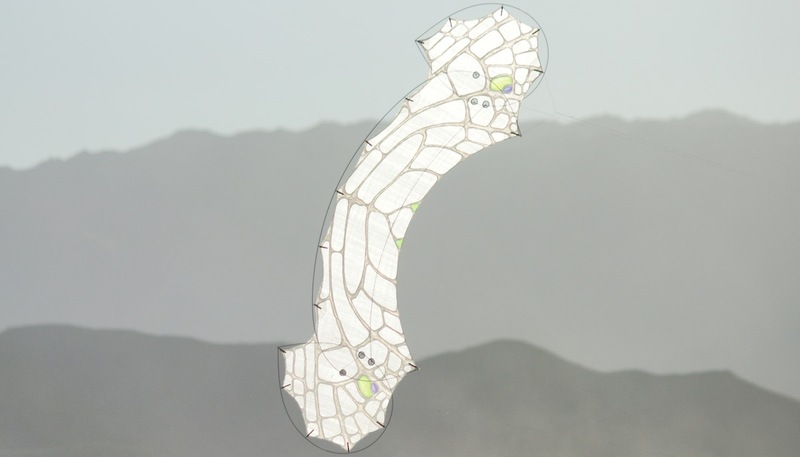 The flow over the wing meets with large smooth curves that mimic wings found in the natural world. The resulting flight is smooth and precise, while controls feel soft and organic. The range is from zero to about 5 mph. 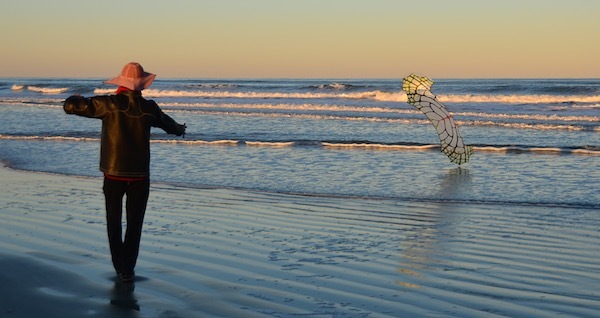 Flying a kite boils down to two elements. First, the element of feel. As we control anything, from a musical instrument to a car, we connect to an unbroken analog signal. 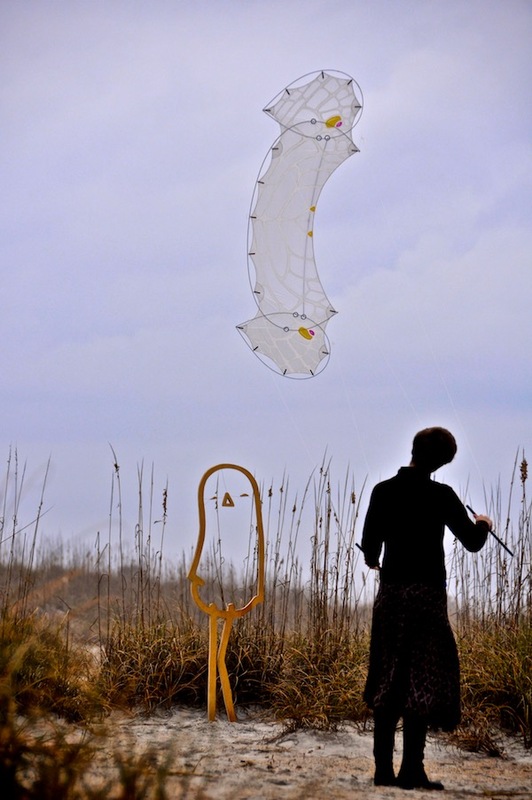 It is this signal that a kite sends back down the line and into our brain. Our design goals state that simply to fly is not enough. 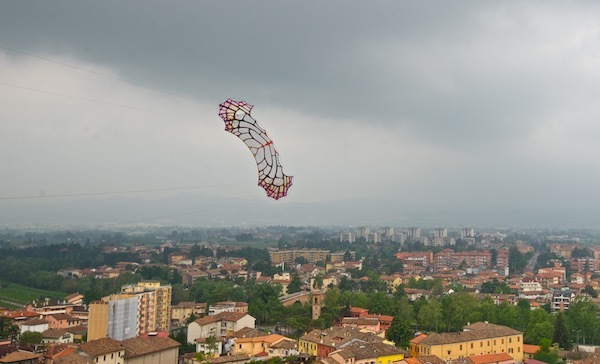 There needs to be a special sensation and satisfaction received as we process the signal from a kite. The second element is image. 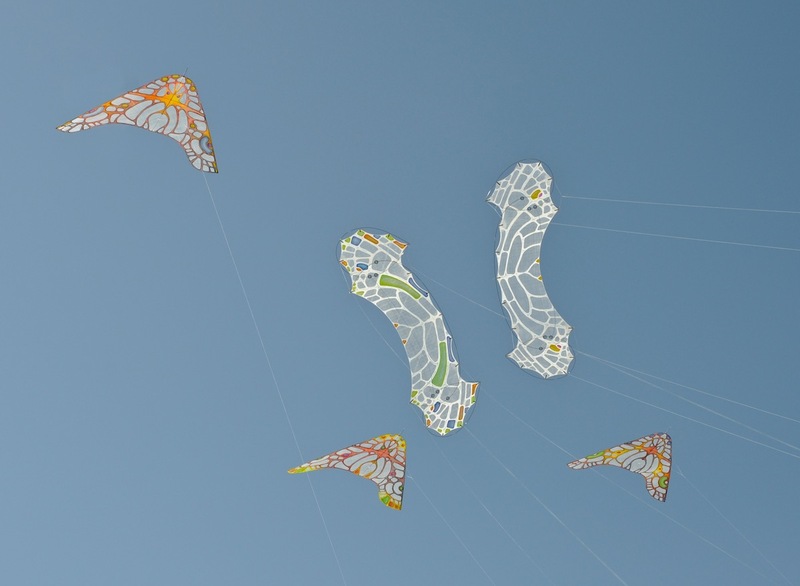 As we first learn to fly a kite, our focus is drawn to that narrow point in the sky where the kite itself is demanding our attention. As flying experiences compound on each other, confort and relaxation grow. The vision of the pilot widens, and eventually we begin to see how we fit into the sky as a whole. This is the jumping point for imagination. Even if only uttered in our mind, perhaps this is the most satisfying question. It signifies that a moment, now gilded with experience, has slipped beyond a point in time. Captured, we can draw upon the memory as the rest of the world rushes by. These are the images that carefully break the rules and live on to hold the story. Art, culture, philosophy, science, and love all grow from these seeds we plant in time. Shown below are two LaceWing Flames, 8 foot spans, and three Morpho Gliders, 14 foot spans. Wind was below 2 mph.